The North Carolina Division of Non-Public Education (DNPE) governs non-public schools (both conventional non-public and homeschool). Many sites, including our own, has information regarding homeschool. However, be sure to refer to the NC DNPE site for the most up-to-date requirements. It is the responsibility of each homeschool to research and comply with NC laws and statutes regarding homeschooling. The information provided here is only to assist. Homeschool families, including HEAR members, should contact the NC DNPE if they have any concerns or questions about NC state requirements. There is no better guide than the NCHE's guide "First Steps in Homeschooling." Click here to learn more about getting started. Homeschools are required to take and maintain annual attendance. The law does not mandate that a particular form be used for student attendance recordkeeping however the NC DNPE does provide a standardized attendance form and encourages each school to use this form. Homeschool students are required in the state of North Carolina to take a standardized test annually. The NC DNPE handbook further explains the legal requirement. Triangle Education Assessments (TEA) is a local (Apex, NC) business that provides K-12 academic achievement tests to homeschoolers across the country. They also specialize in cognitive and career assessment as well. They are very informative and helpful. 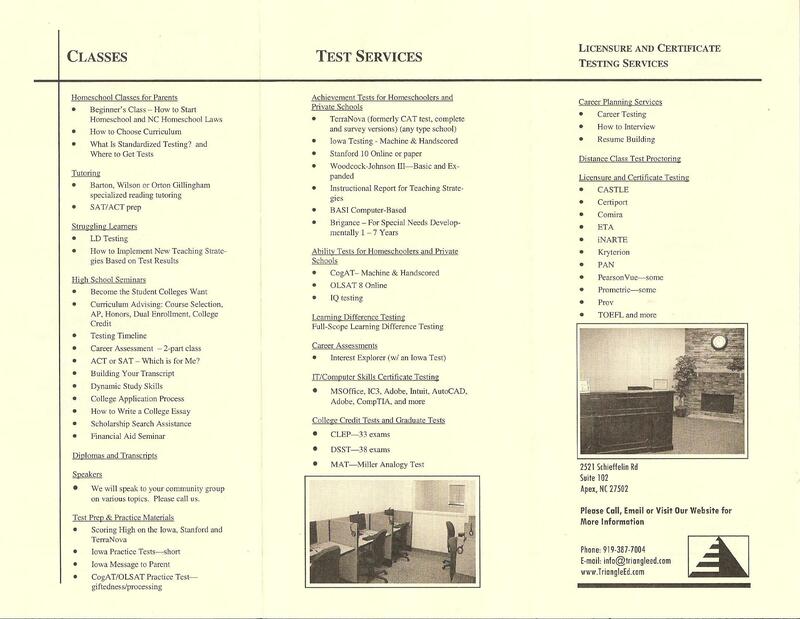 If you have any questions or concerns about testing, you can contact them at (919) 387-7004. NC Home School Testing FAQ Sheet prepared by TEA.